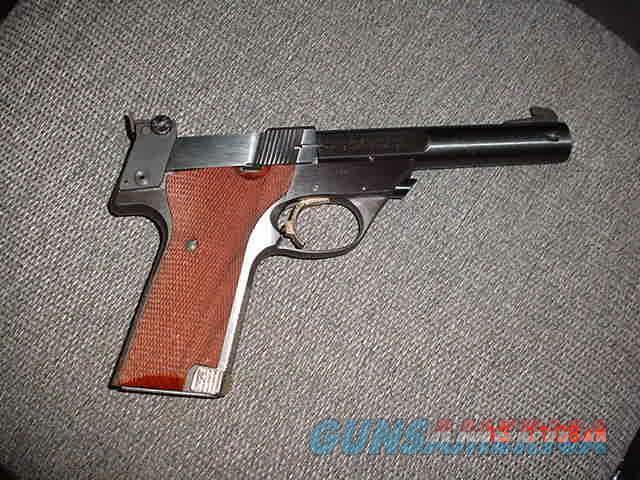 High Standard Supermatic Trophy 22lr,5 1/2" barrel,wood grips, feels great in the hand. nicer in person. Description: Here is a nice clean High Standard Supermatic Trophy semi auto pistol in 22LR, with a 5 1/2" barrel that does remove with the press of a button, & has one 10 round magazine, nice checkered wood grips with thumb rest, gold plated trigger,magazine release & safety. it has been used but not abused,& has a few minor handling marks.. comes in a brand new soft zippered case. serial # ML57096 not sure of the year,but serial # should tell you. a lot of gun for only $795. firm,+$35. shipping to your FFL dealer only. I am an FFL dealer,located in the Clearwater,Florida area.I accept bank & postal money orders,cashiers checks,or personal & business checks,but those take time to clear. no credit cards or PayPal. I now offer 60 day layaways with 1/3rd down & 1/3rd per month. be sure to check out all my other unique listings.. this gun feels great in the hand-perfect balance !! Stock No. : nicer in person-feels great in the hands & very accurate !